It’s a first for me. It’s 3 days before Christmas, and I do NOT have my shopping done. And with all of the Star Wars: The Force Awakens hype, you bet, I’m even farther behind! But that doesn’t mean my son’s Star Wars excitement has slowed one bit! In fact, he’s even more excited about Kylo Ren, Rey, Finn and all of the Star Wars characters. 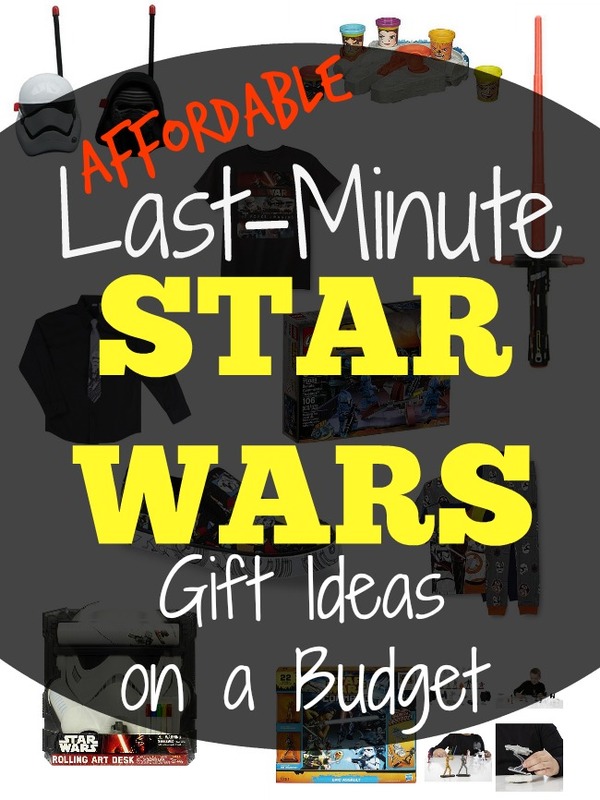 Inspired by his out-of-this-world fan boy spirit, I’ve been looking for the best last-minute Star Wars deals for my Star Wars kid! But who said the holiday deals are gone? No way! 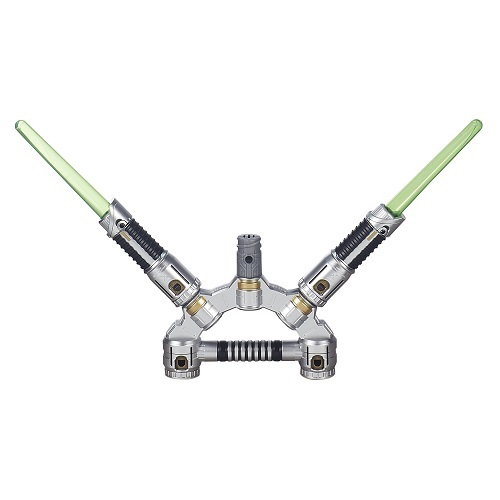 In fact, Kmart has stepped up their holiday deals with TONS of affordable last-minute Star Wars Gift Ideas, with savings up to 67% off The Force Awakens merchandise, clothing, toys and more! 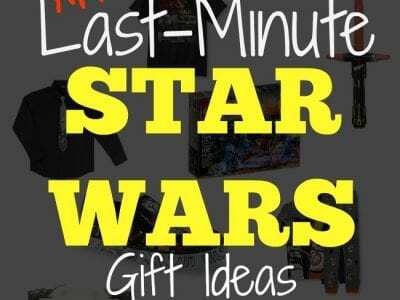 Check out my top 10 Star Wars deals at Kmart going on now through 12/24 for BIG savings and even bigger smiles this holiday season! Before kids, I was a Black Friday shopping queen. Coffee, sweats and ads stuffed in my purse, I loved the thrill of scoring an amazing gift at a fraction of the cost. Add a few sleepless years and 2 kids, I miss those days of bargain hunting. But this year, I don’t have to miss the Black Friday action. I have Kmart. 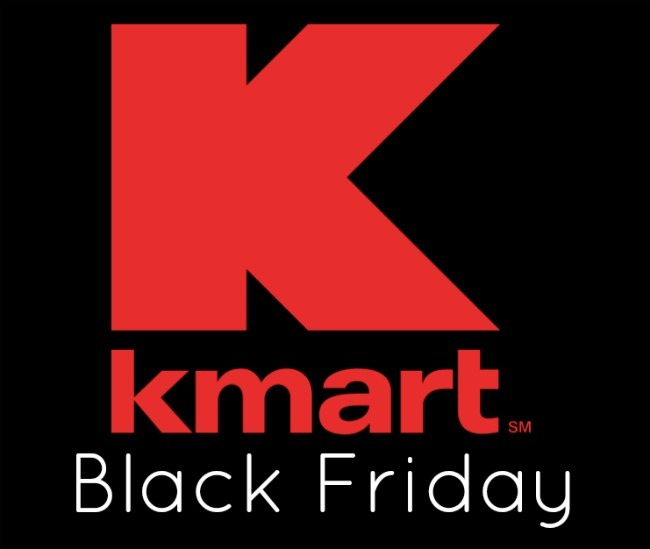 I’ve got all the reasons why you need to shop Black Friday at Kmart this season, and yes, you can still wear your sweats! I love this time of year. Sure the shopping and cooking and preparing can be stressful. But when it all comes down to the heart the season, it’s so much more rewarding to GIVE than to receive. With so many opportunities to give back this time of year, I’m sharing my top 5 favorite ways to give back this holiday season. 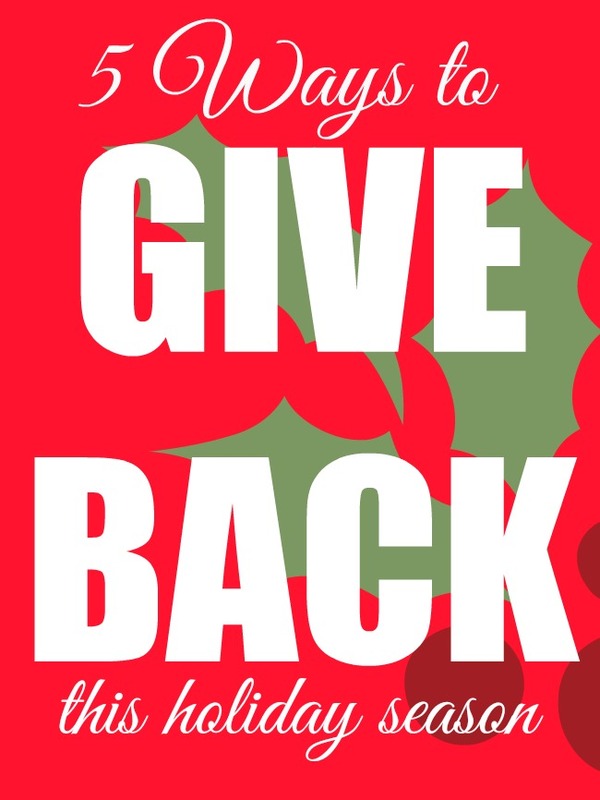 See if we can find some new ways to give back and make a difference during this giving holiday. 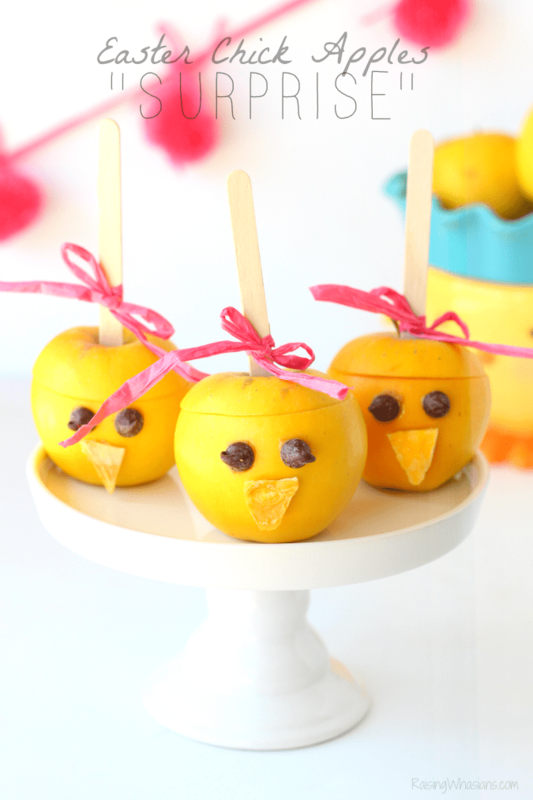 This is one of the best ways that we love getting the whole family involved. Every year we have our kids pick out toys that they love and donate them to a child in need. It’s such a great way to not only instill good character into my kids, but show how much we can bless other people. And while the focus seems to be on kids and toys during the holidays, we also make sure to pick up extra supplies like toiletries, clothing and shoes to donate to local shelters as well. Adults are just as in need as kids during this season, especially when it’s cold outside! One of my favorite things to do during the holiday season, I love surprising an unexpected family member, neighbor, friend with an extra “special” way that we are thinking of them this season. Whether baking cookies, writing a special note in a Christmas card or sending an unexpected “Just for You” gift, surprises are what makes the little things so great. It’s so rewarding to give kindness just because. Maybe finances are tough this season. Or perhaps you can’t offer much extra time this season. I get it. The seasons of life can definitely throw some unexpected curve balls. But we all can still GIVE something. Love is such an easy way to share the holiday spirit. That smile at the checkout line, the “have a good day” to the angry worker, the patience and positive perspective when everyone else seems down, a listening ear can make all the difference in someone’s day. Giving a gift is one thing. Giving a gift that gives back…well that’s a win-win in my book. I’m always on the lookout for that meaningful gift that really moves people. And this year, I’m excited to have found The Giving Hat. Have you heard of this hat taking the world by storm? 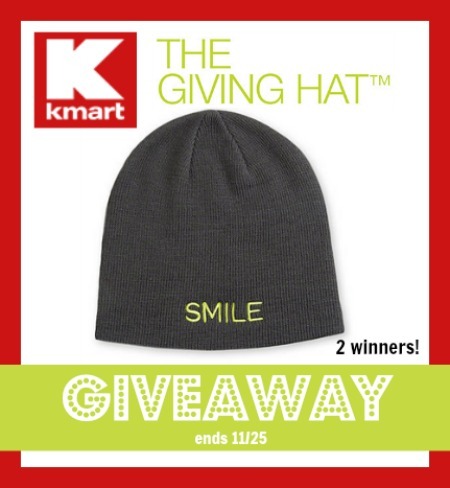 Designed in collaboration with St. Jude, The Giving Hat will be available exclusively at Kmart and Kmart.com/StJude starting November 8 and while supplies last. 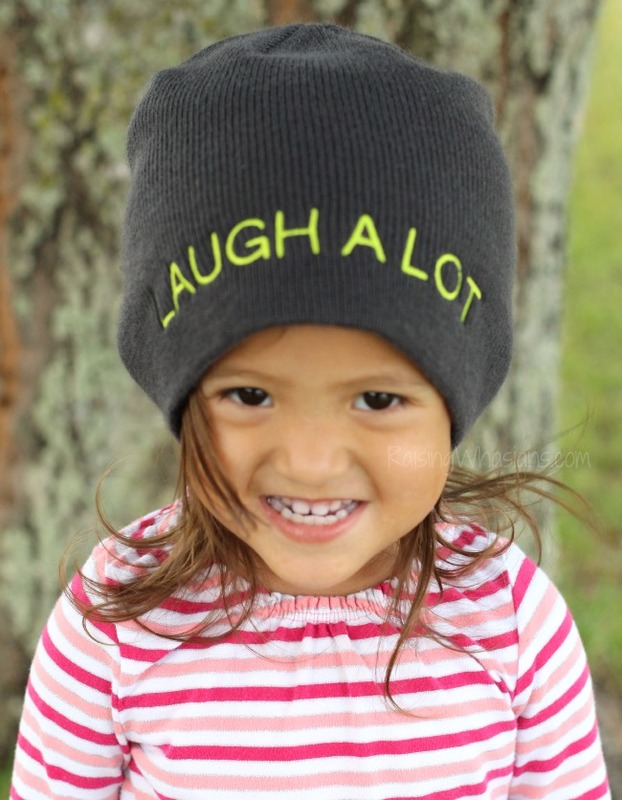 This comfy and warm hat has simple yet powerful messages on each design to give everyone something to smile about. Just a small purchase at just $5 each, this fashion movement not only brings smiles but brings hope. $1 from every purchase is donated to St. Jude to fight and end childhood cancer. Giving back? ABSOLUTELY! What an amazing difference one hat can make! 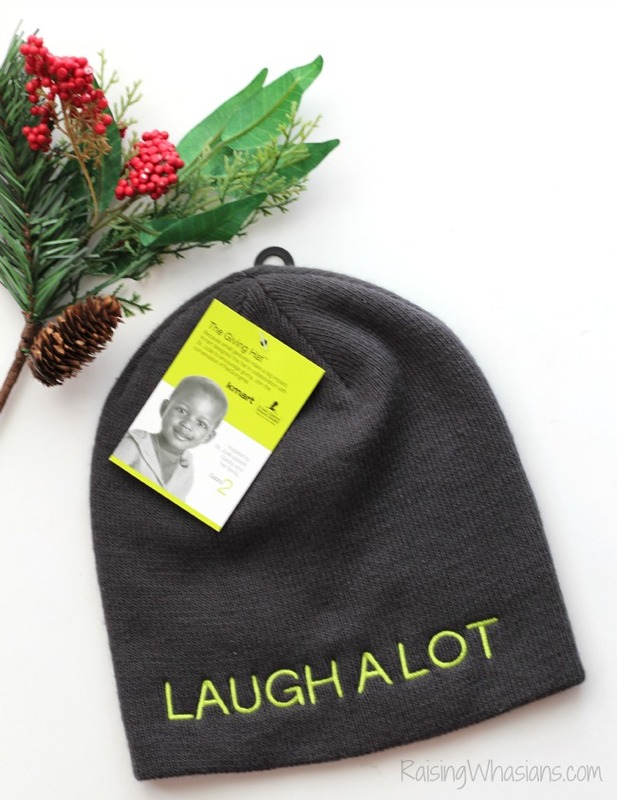 See The Giving Hat in action this holiday season and how 1 hat can bring a smile to your face this holiday season. Find out more and join #TheGivingHat movement at Kmart.com/StJude. Purchase yours and give back so much more than just a hat! Count it, folks. There’s only 65 shopping days left for the holiday season. YIKES! Have you started to check off your holiday gift list? With tight budgets and busy schedules, you may be wondering how you’re going to get it all done this year. Enter in the 2015 Kmart Layaway. 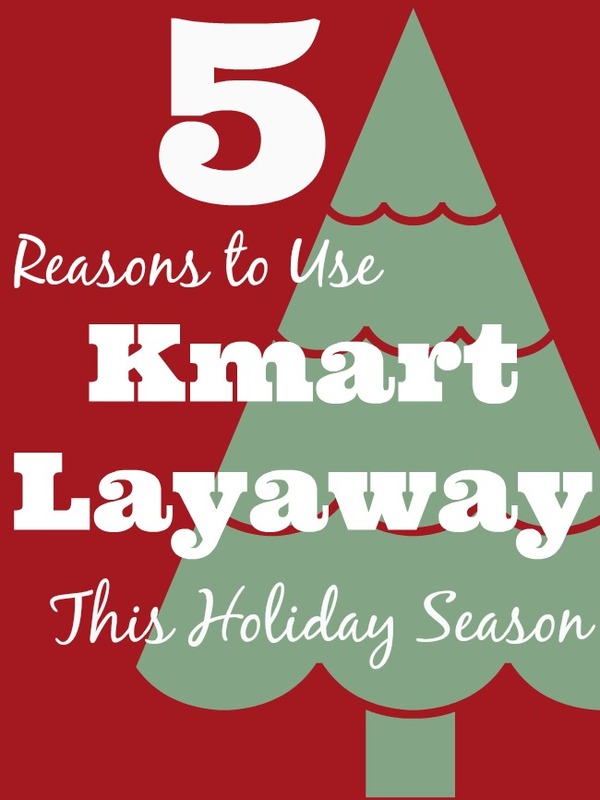 If you haven’t considered using Kmart Layaway for your holiday shopping yet, this year, I have 5 reasons to jump on board! Come join the holiday spirit! Want do to layaway with no hassle? Me too. Kmart Layaway makes it easy to find the gifts you want, the layaway you can afford, and the payment plans that fit your lifestyle. What’s on my kids’ lists this year? Toys, of course! And thanks to Kmart’s Fab 15 Toys List, I was able to snag some of this year’s hottest toys for my littles. So I headed over to Kmart.com and picked out the Lego Star Wars AT-DP Building Set (Lego and Star Wars, I’m feeling like a winning mom! 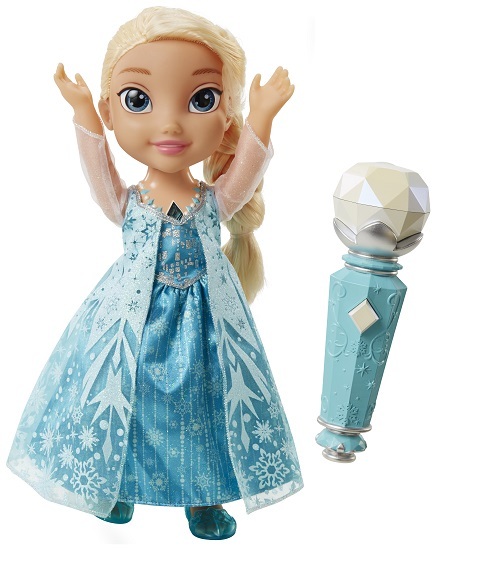 ), and the super hot Frozen Sing-A-Long Elsa for my karaoke loving girl. Just be sure to look for the “Layaway Available” before adding your gifts to your cart. Once you are ready to checkout, head over to your cart. 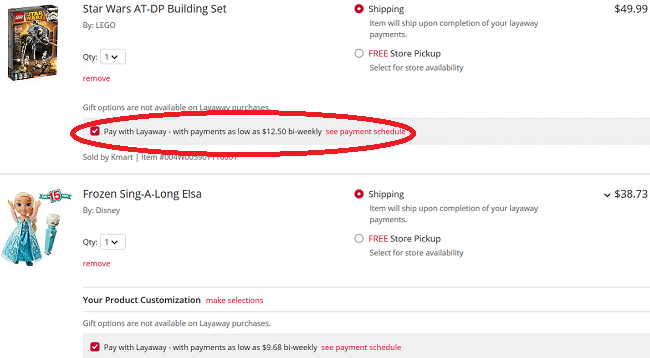 You’ll see the option to “Pay with Layaway.” Just check the box! Then click the “Learn More” to see your payment plan, FAQ’s and more. That’s right. 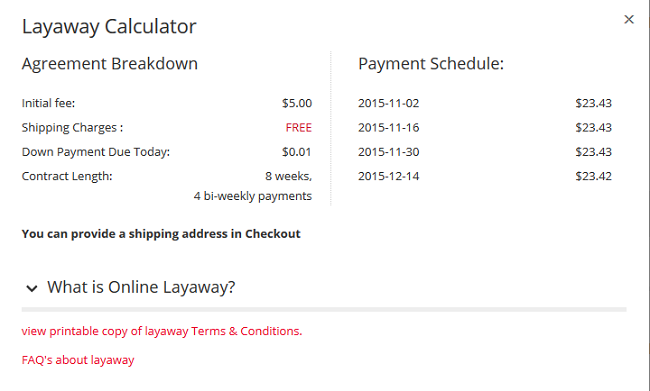 After the initial $5 Layaway Fee, only $0.01 is needed as a down payment today. Ah-mazing, right? And with FREE shipping online and easy pick up in-stores, you know that you are snagging an amazing deal! Placing your layaway order in-store? Then you have a No Money Down Layaway option! Kmart makes it easy for you to pay your Layaway quickly and easily. With easy bi-weekly payment plans, 7-day grace periods, and Layaway Payment Text Reminders (just text LAYAWAY to 56278), you can have your holiday gifts paid off and ready to place under the tree, without the stressful hassle! When you’re ready to make your payments, just head online to Kmart.com/Layaway or in-store at one of the registers to pay off your gifts. Kmart makes it easy to budget your holiday gifting as your family budget allows. With easy payment plans, schedules and contracts, you can see exactly the amount that is owed, the time period to pay and get your questions answered. As a family with 2 kids, I appreciate that Kmart cares about families like mine so we can afford the gifts my kids love without sacrificing quality. It’s inevitable as my kids get older that their curiosity will get the best of them. Finding hiding places in our small 3 bedroom house doesn’t always allow for the space to keep those well loved gifts out of sight until Christmas time. With Kmart’s Layaway, they can easily store my gifts while we are making payments. Once paid off, I can schedule to pickup my gifts at my choosing! I’m certain they won’t be finding their Star Wars Legos and Elsa Doll at my house before Santa arrives! 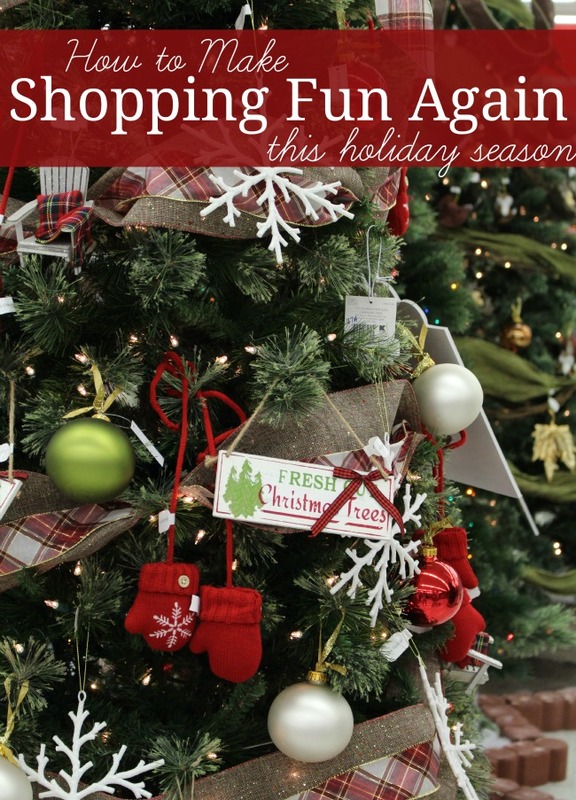 Ready to get started on your 2015 Holiday Shopping? 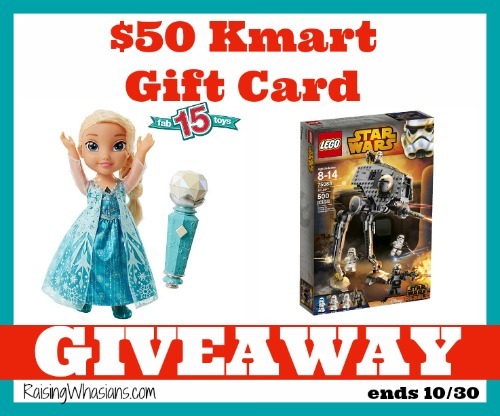 Head over to Kmart.com/Layaway for more information, gift ideas and more! 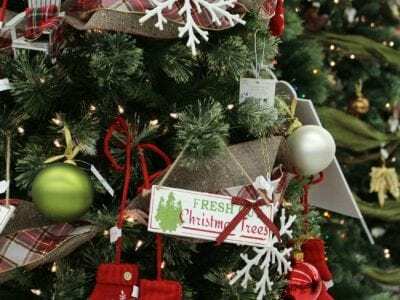 Did you know that it’s less than 100 days until Christmas? It’s never too early to start thinking about the holidays, and this year I have your MUST have toys for 2015. Just announced, the 2015 Kmart Fab 15 Holiday Toys list has arrived, including this year’s hottest and exclusive toys for the 2015 holiday season. Check out what your child will be asking for this holiday season plus scroll down for a gift card giveaway! Worried about what to get your amazing kids this holiday season? Well, look no further! 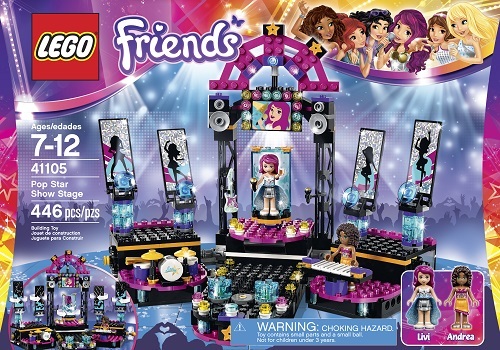 The annual Kmart Fab 15 Holiday Toys List has arrived with this season’s BEST toys for the holidays! 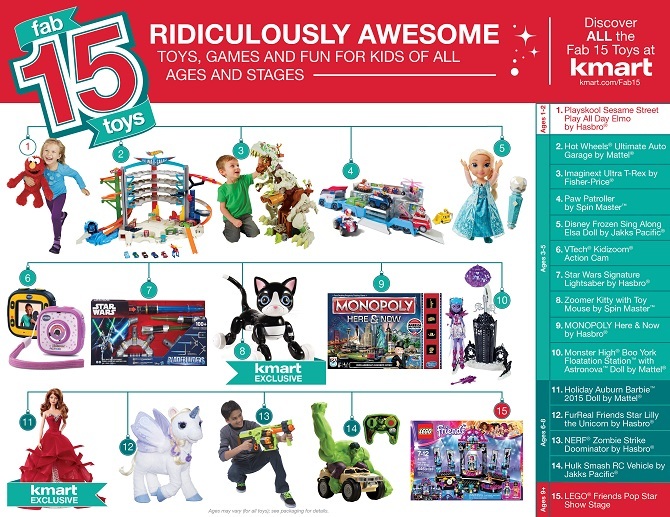 The list, which comprises Kmart-exclusive toys and hot brands like Disney’s Frozen, Star Wars, LEGO®, Barbie™ and NERF,® is carefully curated based on industry trends, input from parents and kids, and more than 50 years experience in knowing what what toys kids love to play with and find under those Christmas trees. A first for the Kmart Fab 15 Holiday Toys List, this year Kmart has help from the first ever Kids Toys Advisory Board – an exclusive group of KIDS of Kmart associates that will serve as toy experts and holiday toy consultants. What’s on this year’s HOT toy list? 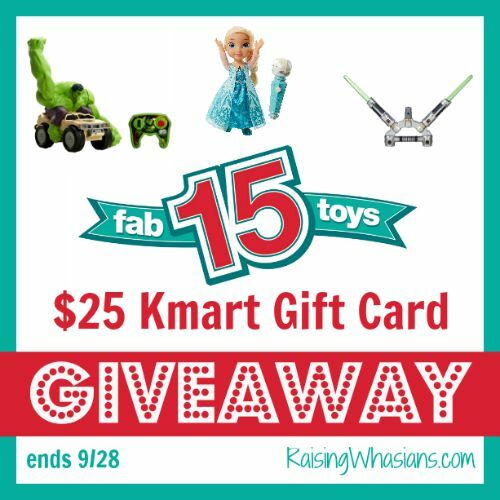 Win All of the 2015 Fab 15 Toys! 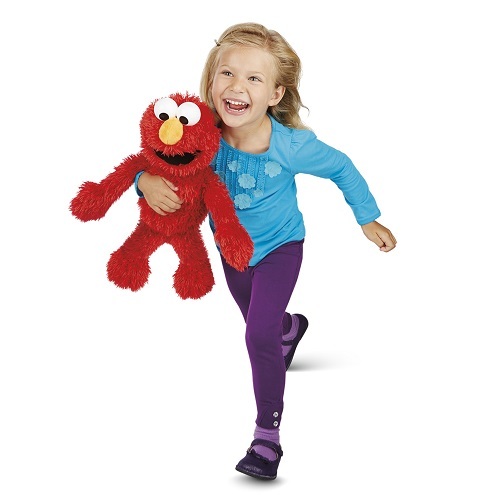 Shop Your Way members can enter for a chance to win all of the Kmart Fab 15 toys at ShopYourWay.com/FAB15SWEEPS. Members will receive additional entries by entering the code FAB15TOYS upon entering the sweeps and will receive an automatic entry by purchasing a Fab 15 toy. Members and customers can shop for any of the items on the Fab 15 list at local Kmart stores nationwide or online anytime at Kmart.com/fab15. In addition to the Fab 15, Kmart has hundreds of exclusive toys from brands and characters kids know and love. 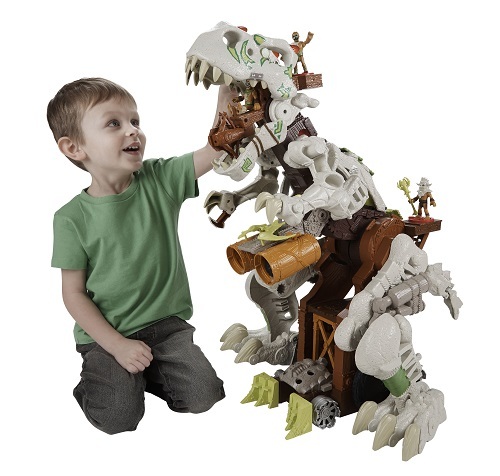 Kmart has updated its toys website at Kmart.com/toys, where members can easily search a broad assortment of ridiculously awesome toys, games and activities, including sorting by age, category, brand and even individual character. 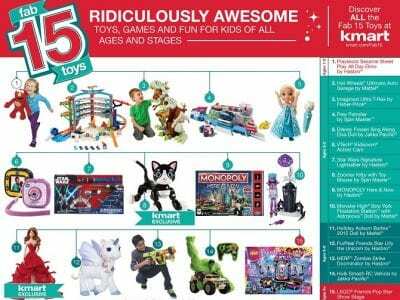 Kmart will also be issuing its annual holiday toy book, which will include this year’s Fab 15, additional Kmart exclusives and a wide selection of on-trend toys for all ages and stages. I already have a few things I’m eyeing for my kids! 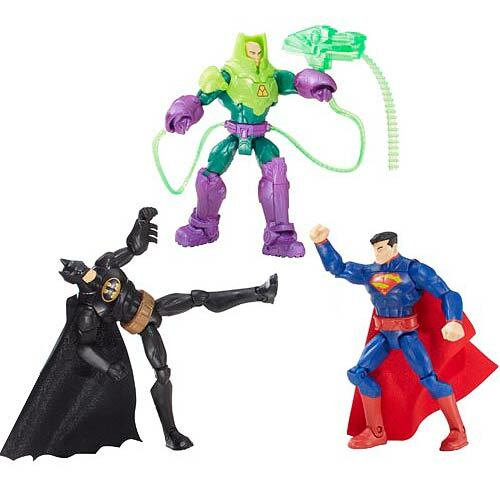 DC Comics Total Heroes Battle in a Box Figure (3-Pack) would have him battling the evil Joker for hours so he and Batman can save the day. BONUS Superman action figure too! And what is my 2 year old princess into these days? Babies, everything babies! This little mommy loves snuggling and soothing her baby dolls. 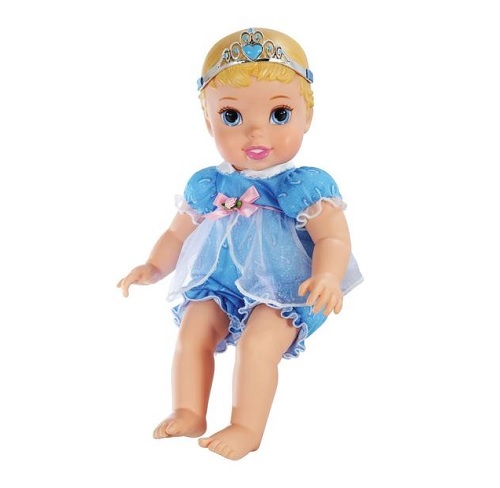 And when you combine Disney Cinderella and baby dolls? Instant toddler happiness. This Disney Princess Baby Cinderella is the most adorable baby for my baby! 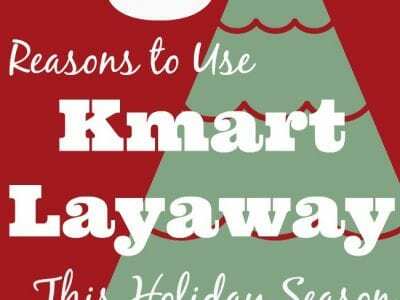 Now through Nov. 29, Kmart shoppers can place in-demand items across dozens of categories on layaway including toys, home products, apparel and electronics, with no down payment for in-store contracts and only one penny down for online contracts. Shop Your Way members earn points on layaway purchases, and membership is easy and free. Gift-givers can stay organized by opting to receive payment reminder alerts via text. In addition, members also get $10 off a layaway purchase of $50 in apparel, jewelry and footwear. For more information on No Money Down Layaway, visit Kmart.com/Layaway. 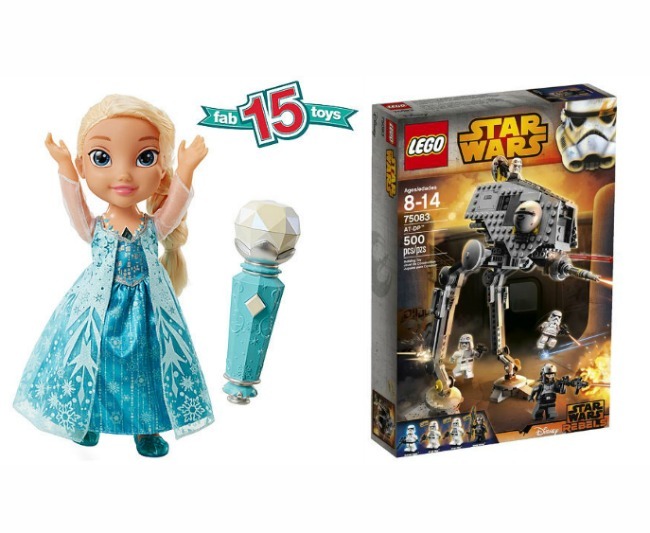 Get a head start on your holiday shopping this year with Kmart and the 2015 Fab 15 Holiday Toy List! 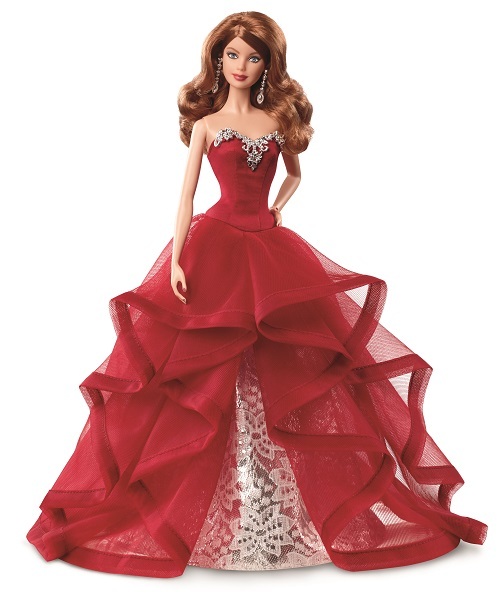 Head over to Kmart.com/fab15 to begin your search for this year’s hottest toys! Disclosure: This post was sponsored by Kmart through their partnership with POPSUGAR Select. While I was compensated to write a post about Kmart’s back-to-school apparel collections, all opinions are my own. We are back-to-school and today marks week #5 of first grade! YEAH! Building up my son’s confidence has been a big focus this year. While always vibrant, energetic and full of life, this guy is a softie at heart with side of worry. Overcoming those back-to-school jitters can be difficult (mommy has been in that boy’s shoes), so making sure that he has a confident back-to-school wardrobe has definitely helped him “super hero suit up” for his big school year. 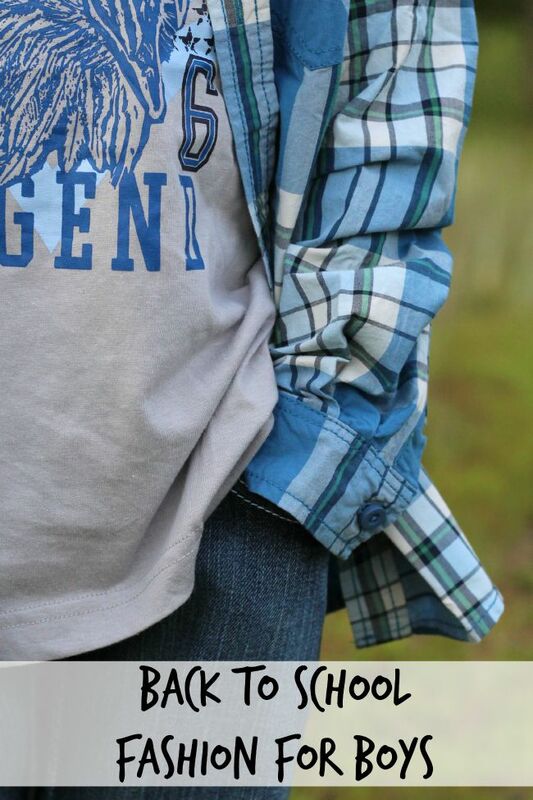 I’m talking about Back to School Fashion for Boys today from Kmart and what goes into a super hero suit of confidence. Are you nearing the back-to-school countdown? I cannot believe we only have 4 days to go until First Grade! No longer the littlest man on campus, I know that this year requires much more than just supplies. 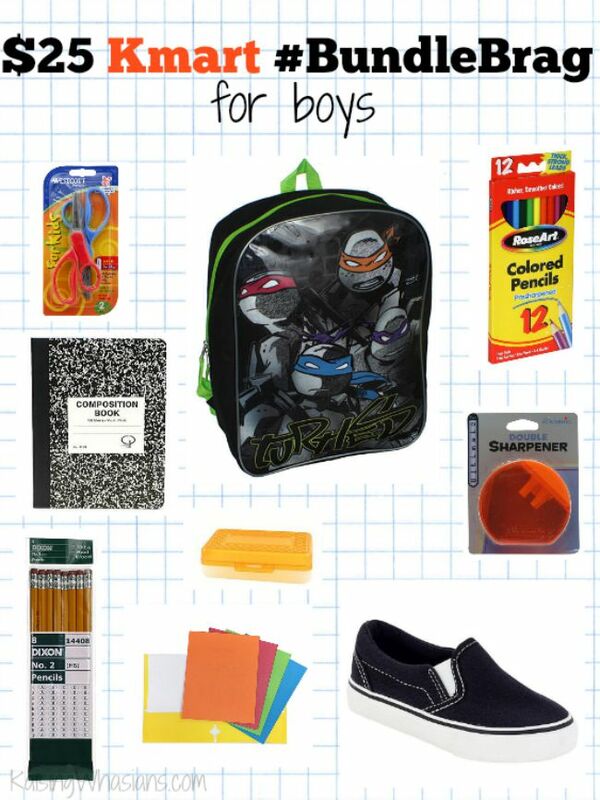 I need all of his Back-to-School Essentials found easily at Kmart! 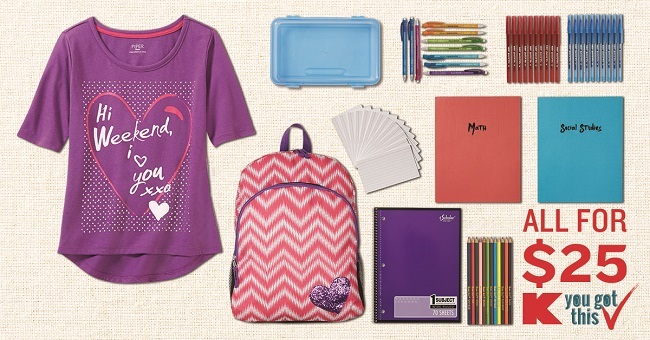 How can you save on Back-to-School Essentials at Kmart this season? Check out these 4 tips to scoring great Kmart quality at a family-friendly price. For stylish kids on the move, Kmart created fashionable bundles with a $25 price point that let kids show off their personal style. 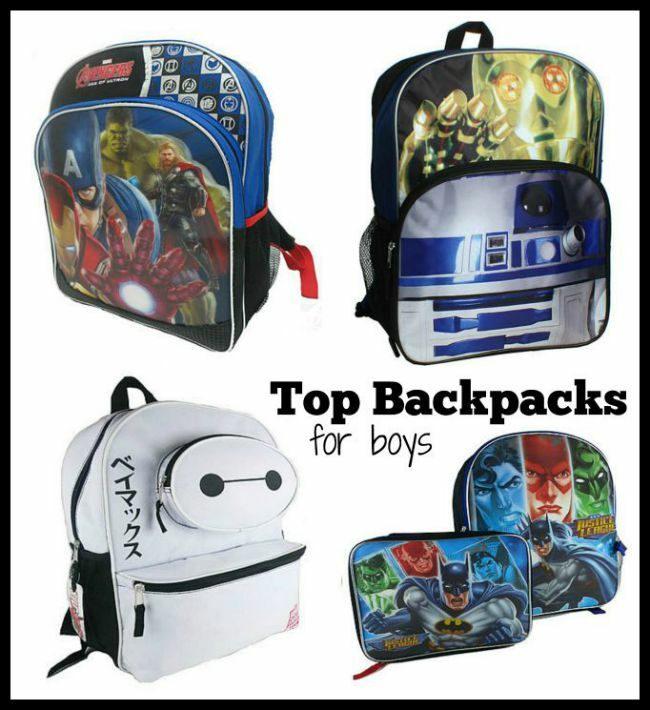 Bundles include awesome items such as backpacks, lunch boxes and notebooks in popular themes that kids love: dogs or dinos, purples or plaids and even skaters or skulls. Parents can brag about the bundles they scored for their kids using hashtag #BundleBrag on Facebook, Twitter and Instagram. We’ve even made our own Bundle Brag Set for our first grader! Check out our top picks for under $25! Need a quality back-to-school wardrobe on a budget? Check out the Kmart Fifteen-Look Fashion Collections! Kmart has curated ridiculously awesome apparel collections that inspire 15 different looks! Kids can go back to school with practically a new wardrobe with just five tops and three bottoms that can be mixed and matched in fun combinations. And the best part? The 15-look collections are priced at either $75 for both boys and girls ages 7-8 or $100 for boys and girls ages 10-12. Kmart understands that parents that need convenient and flexible payment options when it comes to your back-to-school essentials. The list can get long and extensive! For Back-to-School season, Kmart is bringing back the $10 Down layaway program nationwide, giving Shop Your Way members and customers the flexibility you need this time of year. The program offers both in-store and online contracts for coveted items across dozens of merchandise categories. Shop Your Way members earn points on layaway purchases, and membership, as always, is easy and free. Parents can also sign up for layaway payment text reminder alerts, keeping them as organized as their kids on the first day of school. For more information on layaway, visit kmart.com/layaway. And the best part? All of his favorite backpacks are under $15, a perfect price for this budget savvy mom! Ready for Back-to-School? 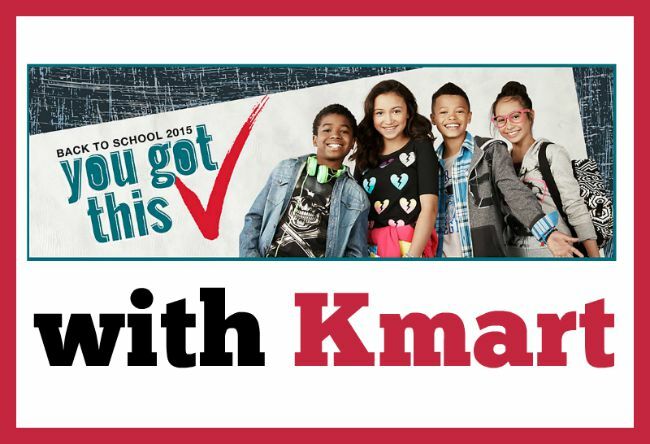 Check out this SWEET Kmart YouTube Video to get your back-to-school season off on a positive note! Then shop big and save big this season at your local Kmart stores or online at Kmart.com/backtoschool. Ready for a giveaway? 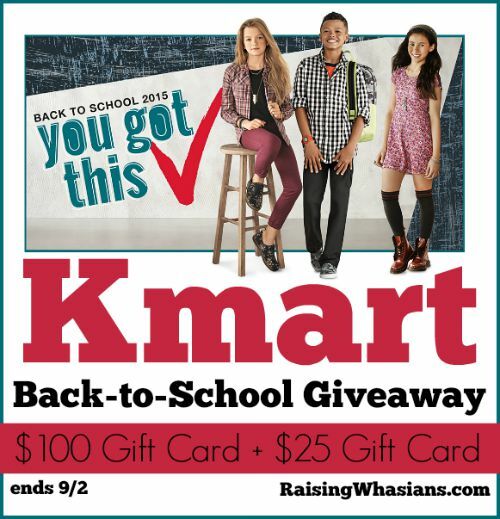 Not just one but 2 winners will receive a Kmart gift card to help with their Back to School shopping! Proud to partner with Kmart on this post for Father’s Day. All opinions are my own. I am totally biased, but I definitely have the Best Dad. Like ever. Nope, you can’t argue with me. He’s pretty darn amazing. 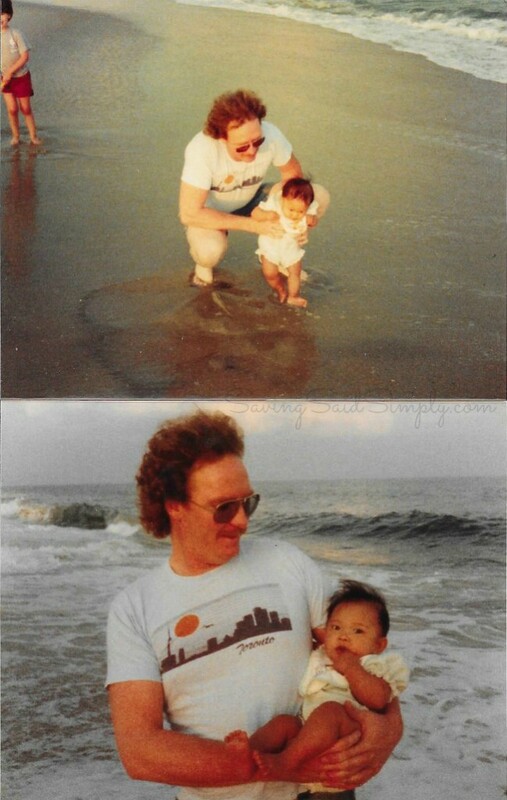 To celebrate the awesomeness that is my dad for the past 30+ years, I am celebrating Dad this Father’s Day with a little tribute to him. What have I gained from my dad? 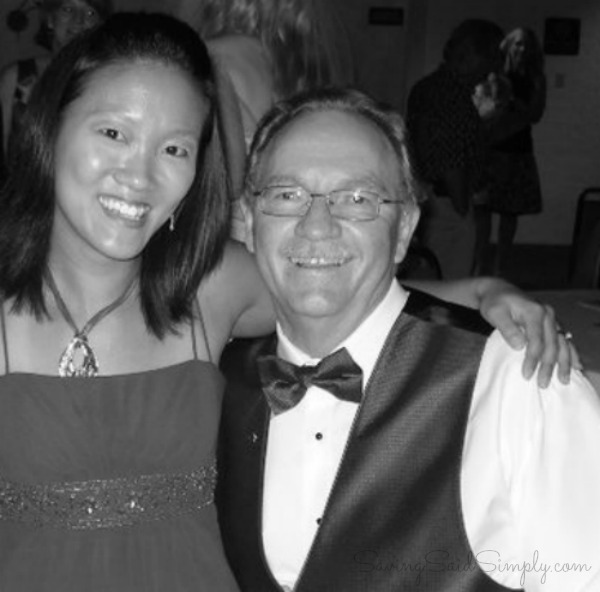 Here’s the top 5 gifts I’ve received from him over the years…and the top 5 gifts I’ve picked for him this Father’s Day 2015. Before there were even thoughts about a husband or dating, there was my dad. My dad made sure to tell me exactly how beautiful I was, just as I am. No make up. No hair dryers. No fancy dresses. He would sit down with me, look me in the eyes and say ” Christie, you are beautiful.” And I knew he meant every word. Even today, he still compliments like the best of them. Our relationship wasn’t perfect. We argued. A lot. My mom would tell me it was because we had similar personalities. Looking back, of course she was right. 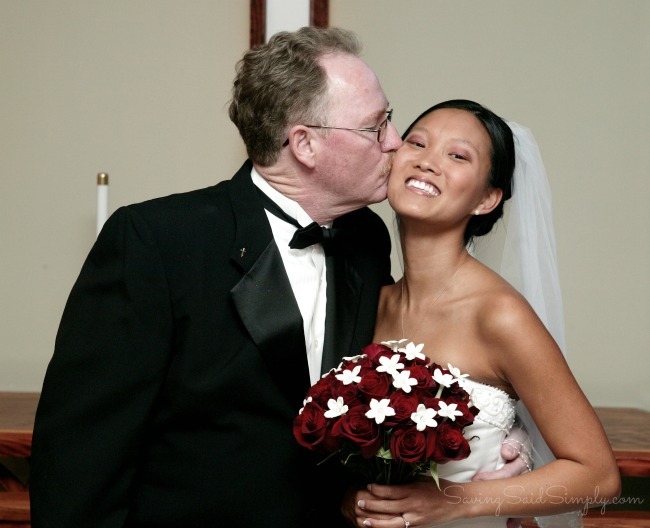 We are both stubborn and “always right.” But it was through some really heated moments that my dad’s softer side would come out. My dad has the heart of forgiveness, always blowing over his steam much quicker than myself. To be honest, this trait is something I hadn’t realized until I became a parent myself. My dad slowly grew into the cooking role of the house as I reached my preteen days and mom went back to work. Back then and even now, my dad was always trying something new in the kitchen. Experimenting, adjusting, tasting (lots and lots of tasting), he soon grew into a really awesome chef. Now, he provides direction and inspiration I use in my own kitchen as I create new dishes. The best part? 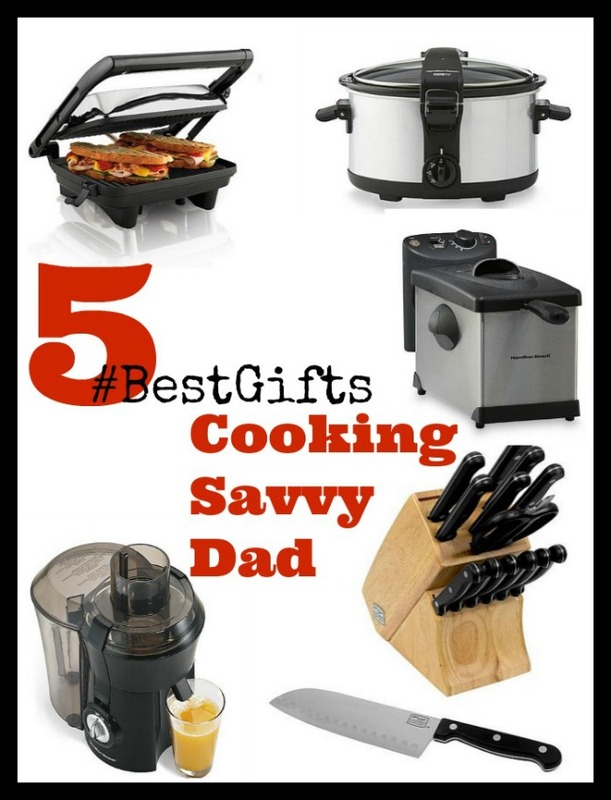 All of these kitchen gift ideas for dad are UNDER $50, and even one under $30! Wow! Using my Shop Your Way account, I was able to tack on an extra $10 off my purchase too! BIG savings + bigger savings = great gifts for my Best Dad this Father’s Day! What gifts did Dad give you? Check out this hilarious new Kmart video to see what this lady got from her dad 🙂 Ready to give back to dad for all of the gifts he’s given you? 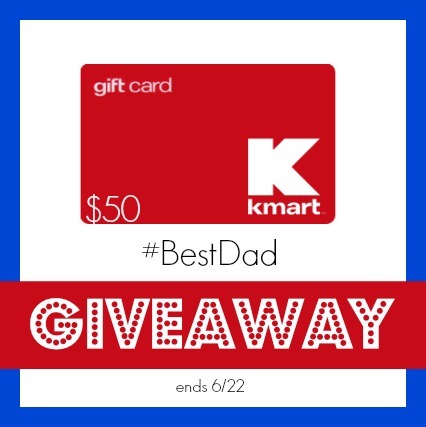 Then head to Kmart.com/FathersDay for an amazing selection of gift ideas for Father’s Day 2015. Everything for your dad from clothing and shoes to grills and tents, there’s definitely something there for the dad in your life! From big personalities to big hearts, grand dreams or small budgets, there’s a great gift for every amazing dad on your list. I’ve found the #BestGifts for my #BestDad this year. I’m so thankful for my dad and the gifts he’s given me this Father’s Day! I support March of Dimes. Do you? It’s April which means it’s one of the BIGGEST months for March of Dimes, one of my favorite organizations! Premature births are no longer a taboo word, but now a term that means hope. And it’s thanks to the amazing research, support and passion from March of Dimes. 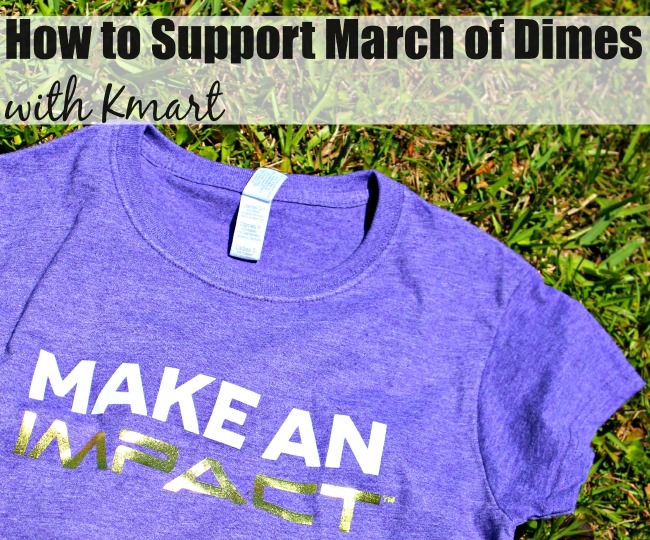 Check out more on how to support March of Dimes with Kmart and an EXCLUSIVE giveaway! For years, March of Dimes has been working hard to ensure safe pregnancies, births and health of children, and so much more. Look at all of the amazing work taking place right now! All of March of Dimes’ hard work is paying off. Their efforts have helped reduce the US preterm birth rate EVERY year over the last seven years. Not only has March of Dimes saved the littlest lives, but has saved an estimated $12 billion in health care costs. And the goals of this organization keep growing. When you have goals this big, you need big help. Kmart understands the importance of March of Dimes’ mission, which is why they are THE top corporate fundraiser for March of Dimes. 2015 marks it’s 32nd consecutive year as a supporter and 23rd year as a national sponsor of the March of Dimes walks each Spring. It’s through Kmart’s help that March of Dimes can continue to help pregnancy, birth and health. The funds raised by Kmart will help support teams of scientists who are working to discover the causes of premature birth and develop innovative treatments at five March of Dimes Prematurity Research Centers and a lifetime of beautiful lives. In efforts to bring excitement to the 2015 campaign, Kmart has teamed up with fitness icon and Kmart ambassador Jillian Michaels to kick-off an amazing season! 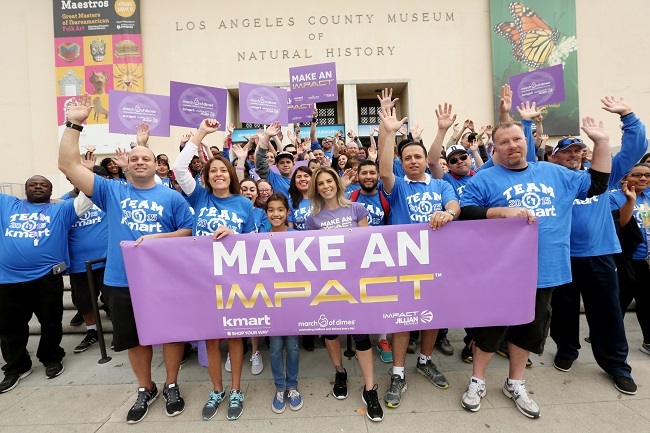 In addition to speaking out in support of the campaign, Jillian Michaels joined Team Kmart at the Los Angeles walk. 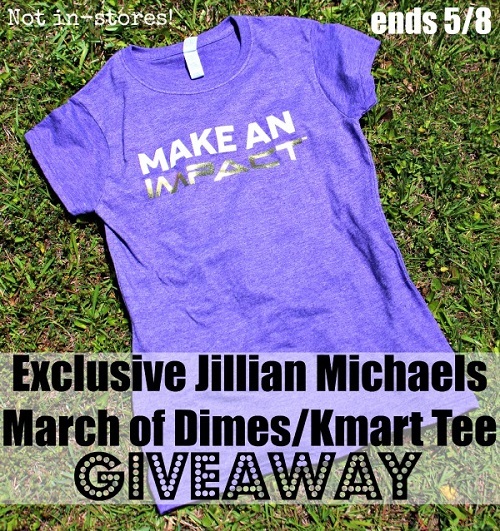 Michaels, whose Impact by Jillian Michaels performance activewear line is carried exclusively at Kmart, designed a custom t-shirt for members of local March of Dimes chapters to wear at walks in other major cities. NOT sold in stores, this tee is making an “impact” for babies everywhere! Fans of the @Kmart Twitter page have chances to WIN one of these exclusive tees, so be on the lookout! Over 700 communities will walk this Spring in support of March of Dimes. If you haven’t had the opportunity to march with thousands of other fellow March of Dimes supporters, you should! So many amazing families, stories and hope is present in each walk. I have had the pleasure of walking in 3 so far, with many more expected for my family. Find a March of Dimes walk in your area and get involved! 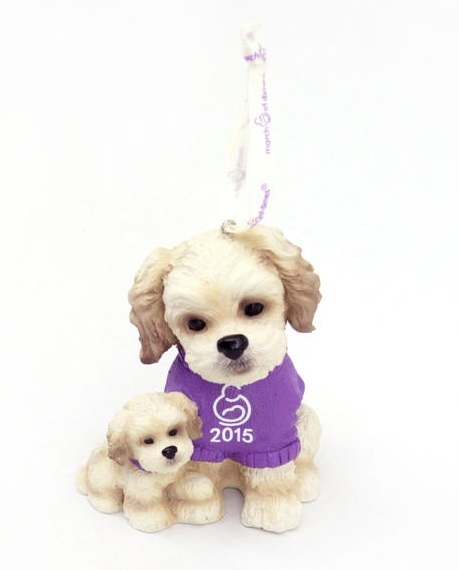 Isn’t this March of Dimes Collectible Puppy Figurine so sweet? Sold exclusively online and in-stores at Kmart, your $5 figurine purchase will also make a huge impact. $1 of every purchase goes directly to March of Dimes. As a special thank you to Shop Your Way members, Kmart is rewarding members who give back – through June 20, members will receive a coupon for five percent back in points on their next qualifying in-store or online merchandise purchase. And SO much more than actual Kmart rewards, you’re rewarded with the goodness of helping out an amazing cause! Supporting research, saving lives, and helping people to grow, you are doing your part to ensure that every little life is cared for! I never for one day take advantage of the fact that my kids were born healthy. I know it’s due to the work of March of Dimes and Kmart that we can have snuggle our beautiful children. I hope your family will consider doing your part this season to make a lifetime impact on children in the U.S. Support the March of Dimes and Kmart’s efforts for healthy babies everywhere!